Playing Time 30 to 60 min. Choose which world power you'll play: Little Bittyland, Bananaland, Bermuda Triabland, Bagmad, or one of many others. Use your country's special power, secrets, top secrets, & propaganda to gain control of or eliminate your enemy's population. When that inevitably fails, all-out war breaks out as players launch stealth bombers, submarines, scud missiles, and fire atomic cannons at each other. Stop attacks with patriot anti- missiles, stealth fighters, decoy missiles, saboteurs, and other special cards. 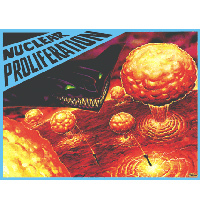 Nuclear Proliferation adds special trading sessions, new top secret and other special cards. It's a sarcastic, humorous look at the futility of Atomic Warfare in the post-cold war 1990's. Nuclear Proliferation can be played by itself, or combined with Nuclear War, Nuclear Escalation, or both!